(CBS/AP) MINNEAPOLIS - Byron Buxton was overcome with emotion when he stepped into the Minnesota Twins clubhouse on Tuesday and saw a white jersey with his name on the back hanging in front of a locker. Just imagine how the 18-year-old outfielder felt a few hours later. The Twins agreed to terms late Tuesday night on a contract with the No. 2 overall draft pick that includes a $6 million signing bonus, according to CBSSports.com's Jon Heyman. The deal is expected to be signed Wednesday. The bonus is the largest given to a player in this year's draft class, $1.2 million more than No. 1 overall pick Carlos Correa, a shortstop chosen by the Houston Astros. Baseball America first reported Buxton's agreement. The bonus also breaks Joe Mauer's team record $5.1 million draft bonus, Heyman notes. Buxton made the trip to Minnesota on Tuesday to take a physical and wrap up his contract negotiations, and he even got to take some batting practice with the Twins before their game against Philadelphia. He made a nice first impression by popping a pitch over the fence in left-center field. "It took my breath away," Buxton said of seeing his name on the No. 1 jersey. "I wasn't expecting to see that, but I'm glad I did." 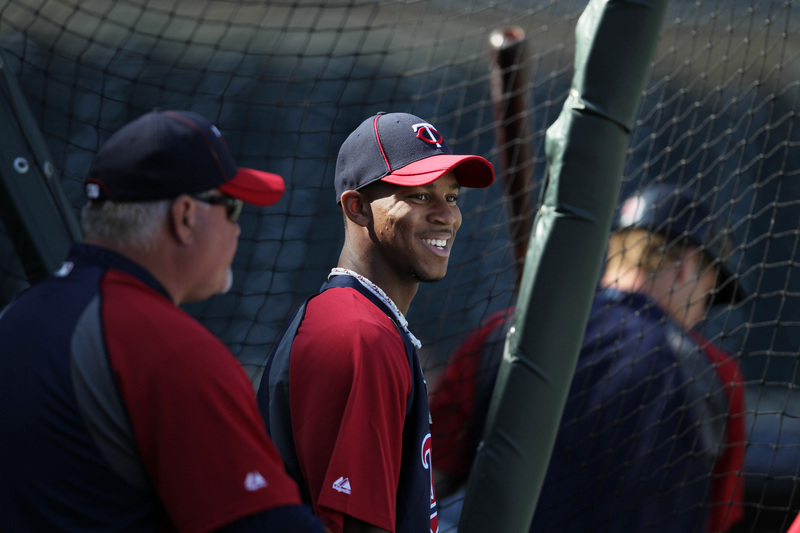 The Twins hope that Buxton will be the one who eventually leaves fans and opponents gasping. He is the Twins' highest draft pick since Joe Mauer was taken first overall in 2001, and they didn't hesitate to grab the speedy outfielder from Appling County High School in Georgia despite having a greater need in the organization for pitching. General manager Terry Ryan said he expected a deal to be completed "shortly." "We brought him in to expose him to our major league coaches and our manager and our players," Ryan said, before turning to Buxton. "I thought he did quite well out there for a young guy that came up here, 18 years old, not been around the type of caliber that these guys are, but you did quite well there." Buxton took batting practice with two former MVPs  Mauer and Justin Morneau  and catcher Ryan Doumit. He sprayed several balls into the outfield, and capped the memorable day by putting the one into the bullpen. Before Buxton left, Mauer gave him a souvenir  one of his bats. "It was the best feeling I've had so far," Buxton said with a wide smile. Buxton isn't expected to be in contention for a spot in the majors for at least four years, but expectations are high for him and the organization. "He's a nice-looking young man," manager Ron Gardenhire said. "We'll see how he does when he gets down to the minor leagues, but he looks like he's got a lot of tools. He looks like he's a talented young man, which he must be or we wouldn't have drafted him with the second pick."